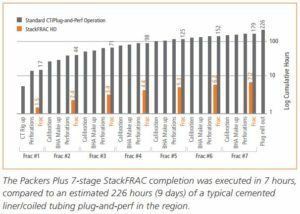 Packers Plus worked with an operator in Argentina to develop a cost effective completion design that could efficiently stimulate multiple stages while improving on production from previous wells in the region. Some operators in Argentina use plug-and-perf with coiled tubing to set plugs and cut perforations for each stage. Since coiled tubing moves through the wellbore at 10 to 20 metres per minute, each trip requires several hours. The operator wanted a faster completion system that would avoid proppant overdisplacement. Overdisplacement is generally unavoidable using plug-and-perf because additional fluid is needed after each stage to set up the next stage of charges and plugs. This pushes proppant deep into fractures, allowing fractures to seal near the wellbore. 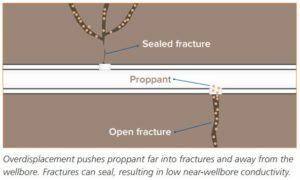 Studies have shown that overdisplacement leads to poor near-well conductivity, which is correlated to lower production. The operator chose the Packers Plus StackFRAC® HD system based on the company’s international expertise and historic success in the region. Because the StackFRAC system uses a continuous pumping operation and does not require trips between stages, the operator was able to control fluid volumes, avoiding overdisplacement. 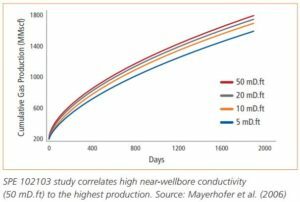 After the 4.5-inch, 7-stage StackFRAC HD system was installed, the stimulation program was completed in 7 hours, averaging one stage per hour. In comparison, using a coiled tubing plug-and-perf technique, the completion would have taken an estimated 220 hours (over 9 days) based on a typical smooth operation in the region. 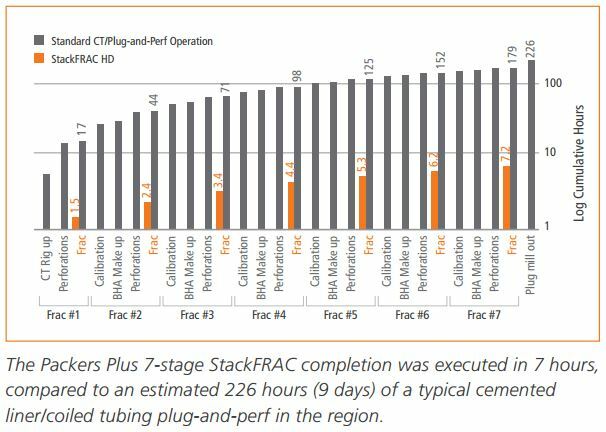 The StackFRAC completion was done more than 30 times faster, saving the operator thousands of dollars. Packers Plus has helped operators design open hole completions in Argentina since 2008, and specializes in delivering high efficiency solutions for multi-stage completions.